You can choose your bet value per line from £0.01 to £50. Then choose how many of the 10 paylines your wish to play, and then you’re ready to spin! If you’re feeling lazy, choose autoplay for 10 to 50 spins and lean back to enjoy the results. The Wild – simply the word “Wild” — only shows in the Hi-Roller option, substituting for all symbols other than the Scatter. Scatter: The Big Banker Logo. Landing 3 of these anywhere on the reels will trigger the bonus feature. A Super Big Banker symbol may also show, promising even more riches. Gold Safe: This is, by far, he highest value “regular” symbol. Go for it! Play it safe. Diamond, Cash Wad, Gold Ring, Champagne Bottle, and Silver Coin are less than half the Gold Safe multiplier. 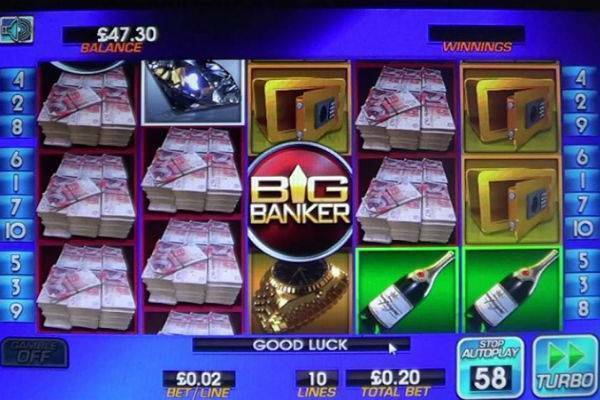 Big Banker is not a progressive slot, but that’s doesn’t mean it’s impossible to “break the bank” on one spin. The maximum single-spin prize is a not-too-shabby £250,000 from landing 5 Safe symbols on an active payline at max bet, which can bring you 500x for each line. That can give you the “high life” instantly. Big Banker bonus game: Landing 3 of the Big Banker Logo scatter symbols anywhere in view will trigger the bonus game, which resembles the game Deal or No Deal. You start with being given 10 seconds to bank or reject a random amount that is lit up. You want to aim for the bigger ones of course, but time is of the essence and you don’t want to run out of time. At the end of the period, the accumulated bonus win amount is credited to your balance. Time is money: an extra scatter will buy you more time. If you run out of time, however, any banks you have left at the end of the bonus are lost. Gamble Option: a gamble option is also available for your wins. If the pointer lands on the green part of the wheel, you get an increase to your winnings. The feature concludes when you choose the Take Win option rather than continuing to play. The Gamble button appears on the lower left and can be toggled on or on. Big Banker won’t win any artistic prizes, but it’s a decent, clean-looking video slot with a nice colour palette: shades of blue are contrasted with the decent illustrations of the game symbols. There are pleasant melodious tones as the reels spin, but nothing which is likely to take home a Grammy. With a RTP of 94%, Big Banker gives you a decent shot at making bank. Like a real world bank, you are given many incentives to invest more and more. High rollers are rewarded with wilds and scatters, while penny players will miss out on some of the fun. So bear in mind that you will want to come to this slot with a decent bankroll, or take advantage of the free bonus offers at some of our recommended casinos.